Very much a draft ditty for May 1 and Kerry O’Connor’s 55 word prompt on Real Toads. 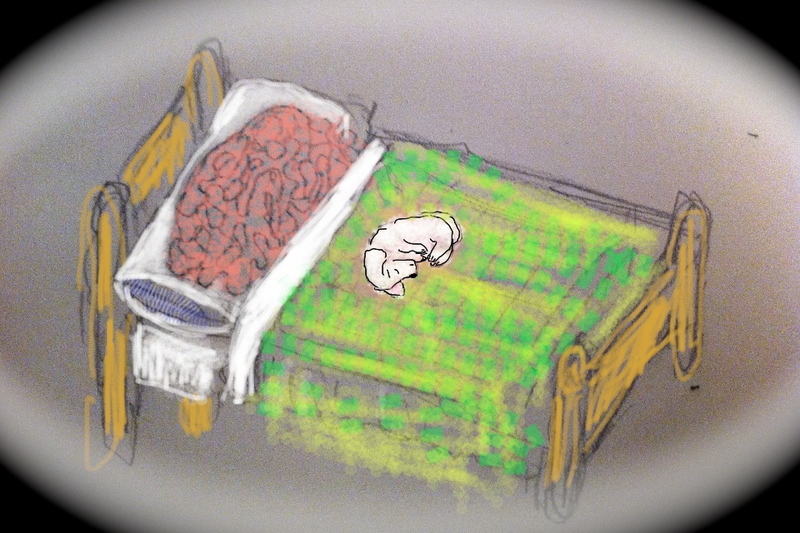 I’m just doing recycled drawings at the moment; this of a brain in bed, with canine companion. This entry was posted on May 1, 2016 at 10:07 pm and is filed under dog, poetry, Uncategorized. You can subscribe via RSS 2.0 feed to this post's comments. I do like the brain in bed! Particularly with canine companion. Poor thing, hope it feels better soon. Rather a chilling 55, k–how often our brains ache with some strange possession–you give a very real twist to the knife of perception here, because so often we don’t know that name. the incantatory rhyme just seems to make it all more sinister. Thank heavens for canine companions, on such days. Love the ditty, and the drawing, very much. My brain aches constantly! I enjoyed this very much! “inhaled pain” — I love this. And I get migraines – and have a sweet pup – so I LOVE the illustration.